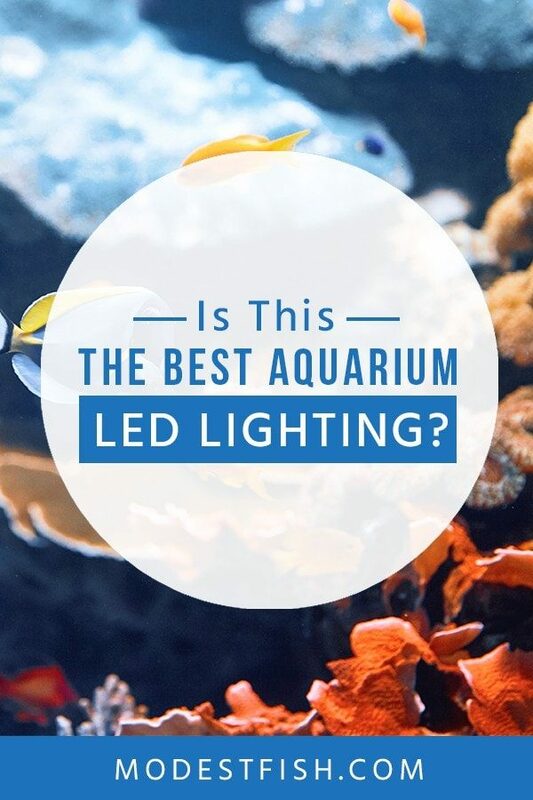 The best LEDs will illuminate your – enhancing the colors of your fish, create depth, and highlight your aquascaping. If you’re raising, or looking into the prospect of raising plants or corals, you’ll know how important lighting is. They rely on receiving the right spectrum of light and intensity so they can grow and remain healthy. Buy wrong, and you’ll put the health of your inhabitants at risk. 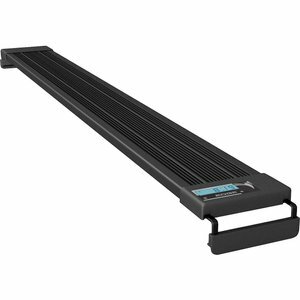 Aquatic Life LED Aquarium Light Fixture 36"
**Before we discuss the individual product reviews, I’d like to speak to you about how you can choose the best one for your setup. If you’d rather skip to the reviews, you can click here. There’s a huge variety of different LED aquarium lights currently available on the market. And it’s definitely not the case of one size fits all. So, before you go and purchase your LED lighting, you’ll need to take into account what will work best for you. This one’s fairly simple, LED lighting comes in a range of different of sizes. The bigger your aquarium is, the more light it will need to light it up. You’ll need to look for one with a lot of coverage and widespread intensity. 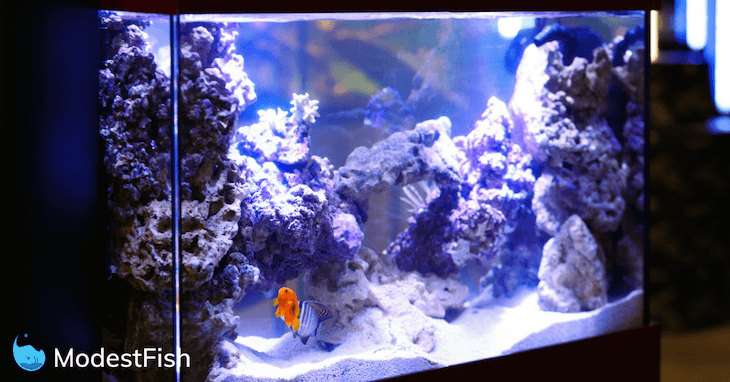 For smaller aquariums, you’ll need less light and less coverage. Now, you definitely don’t want to have to go replacing your LED’s anytime soon. So it’s best you choose your lighting with quality in mind. Make sure the materials are strong and durable. And spend wisely, it’s always best to look for quality over price. Cheaping out will often result in you having to replace your fixture, and in the long run it tends to cost more. You should choose LED lights that aren’t likely to break, loose output, or change color spectrum in the future. One of the best thing about having LED lighting are the cool effects you can create in your tank using the different spectrums. What colors would you like to see in your tank? Would you like to enhance the colors of your fish or corals? Have to taken a look at other people’s tanks and taken inspiration from their color combinations? 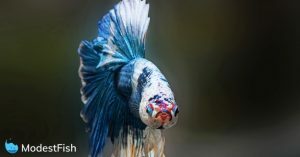 Equally as important as the internal effect, you’ll want to make sure that you’re aquarium still looks good from the outside, and not an eyesore. I recommend using LED lighting that doesn’t use big bulky equipment, it tends to take away from the aesthetic appeal of your tank. You should also consider where your aquarium is located. Is it at work, your bedroom, living room, hallway, or basement? Make sure your lighting suits it’s location. Most LED lighting will come with software and programming options. These will allow you to control the lights. Controls can be in the form of remotes with buttons and sliders, or will have a control system on the fixture. Some will be more advance, requiring the use of a computer. These come with a vasty array of customizations such as, options for adjusting timing, light intensity, scheduling, custom color display, weather effects, and more. On some, you’ll even get the option to mimic times of the day: sunrise, midday, afternoon, evening, and night. 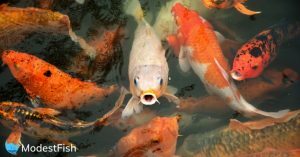 These can be great options if you’re housing fish that like to stick to a schedule. What Plants and Corals Are in Your Tank? Some LEDs will provide more PAR output that others. So you’ll need to identify which plants and corals you house, and how much light they need to flourish. Not enough light, and they could die. Too much light, and they could die. Also, consider what growth stage they’re at. Plants and corals that are still in their growing phase will need different levels of light intensity than those that aren’t. That’s why it’s always good to be able to adjust your lighting. If you’re unable to adjust your light intensity, you’ll have to keep purchasing different types of lighting. Now, it’s likely you’ll already have a budget in mind. But… don’t purely take the the initial cost of your lighting system into account. Break it down, look at the cost per LED. This way, you’ll get a better idea of where your money is going. It also makes it easier when comparing different LED lights. Take into account the cost of running the LEDs. Your average LED bulb lasts for about 50,000 hours. That means, if you ran your LED’s for 24 hours a day, 7 days a week, they’ll last roughly 5.7 years. Not bad eh? LED’s tend to be more cost effective in the long run. Check out this table below. You can clearly see, that although LED lights may cost more upfront, the cost of running them over a course of their lifetime is a lot cheaper. 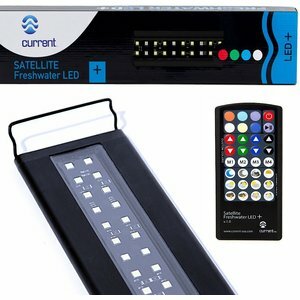 Our shortlist of the best 5 LED lights on the market includes freshwater and reef lighting systems. We’ve really focused on bringing you a range of lights that come with various programming abilities. Created for reef tanks, the wide spectrum of high powered SMD LED chips uses 8000k/12000K ultra-bright white LEDs, along with 445nm/460m, actinic blue LEDs. These recreate the light spectrum needed for marine fish, inverts, live rock, and corals. And with 120-degree lenses, they’ll evenly spread the light throughout your aquarium. The Ramp Timer Pro is cool – recreating a realistic 24 hour light cycle. The timer uses slow ramp-up and down, which gently acclimates fish – preventing light shock. You’ll get four dynamic effects and presets, so no complicated programming. These Include, cloud cover, fading lunar, and lighting storms. And you can control all of this from the handy remote. This lighting fixture comes in four different sizes: 18-24”, 24-36”, 48-60”, and 72”. Featuring a 3-channel timer, you’re able to independently control the bright white, mixed color, and Moonlight LEDs. This will allow for more color combinations. And lighting which replicates underwater daylight, sunrise/sunset, and shimmering blue moonlight. The backup battery will save your settings in case of power failure. What’s great about these LED lights, is you’re able to customize the ramp up and fade between 10 minutes and 2 hours. The LED’s are equally dispersed at 120-degrees, ensuring the full spectrum of light reaches all areas of your tank. An acrylic cover lens protects the lights from accidental water spray and condensation – improving the lifespan and durability. Built to sit on your tank, so cannot be hung over it. Kessil A360WE series come with two options: the Tuna Sun for freshwater aquariums and Tuna Blue for saltwater aquariums. These LEDs aren’t like the others on this list. Kessil design and manufacture their own LEDs, and have been in lighting and optics for over 27 years. This ability to control the technology from the beginning, with a specific purpose is what sets them apart. Very easy to hang above your tank, or you can use the Kessil A Series Gooseneck to attach it to a rimmed or rimless tank. It includes 45 LEDs that are tightly packed together, providing outstanding color blending. You won’t see specs of red or green light in your tank. And the natural shimmering effect is unrivaled. It’s possible the controllability that may turn you off. You get two knobs: one controls the intensity and the other controls light spectrum. However, if you don’t want to spend hours controlling each individual spectrum. Or hook it up to your computer to program, then this is a great choice. This full spectrum LED light has an interesting design. The color lights are in a criss-cross style among the white bulbs. Could seem odd or random, but Viparspectra claim that this layout is a result of thorough research. And is optimized to help maximize health and growth of plants and corals. The LEDs use two different channels: one for blue and one for white. This allows you to independently program each one. The built-in timer allows you to program a separate intensity for either channels, as well as the on and off times. And it’s very easy to do this using the handy remote control. The fixture includes an adjustable hanging kit. Featuring lock assembly for a more secure mount. One light is ideal for a 24x24x24” tank. What makes this unique, is it’s fully automated 24/7 system. Starting with dawn, it will transition into sunrise, followed by high noon, and then scaling down into afternoon, evening, sunset, and starry blue moonlight. It runs on real time and will repeat itself every day, making it completely hands-free. If you don’t want to use this, there are four memory slots. You can customize and save your favorite color combinations and lighting intensities. The 7000K Daylight LEDs do a great job at allowing planted aquarium to thrive. You’re able to control everything on the easy-to-use remote control. Where you’ll also have the options for thunderstorms, cloudy/sunny days, and moonlighting effects. If you’re looking for the best possible quality, go for the Kessil. However, not every wants the best possible product because you don’t necessary need it. Therefore, the question is: what’s offers the most value (provides the features I need) compared to price (is in my budget). For saltwater/marine tank owners, go for the Current USA’s marine orbit. For freshwater/planted tank owners, go for the Finnex Planted+.